Brady’s new durable black polyester labels are ideal for regulatory labels on electrical components, finished goods, automotive labels, general ID and asset tracking. Brady (NYSE:BRC), a global leader in industrial and safety printing systems and solutions, today announced its new ultra-durable black polyester labels (B-8117). These labels achieve the black color through the adhesive layer rather than the topcoat, which results in more robust color permanence. Since the color is sealed inside the label construction, color durability is dramatically increased, making it less likely to lose the black appearance over time. The powerful combination of this material’s topcoat and the R6800 ribbon produce superior print durability against both abrasions and harsh fluids, as well as consistently achieves Barcode Grade B or greater. 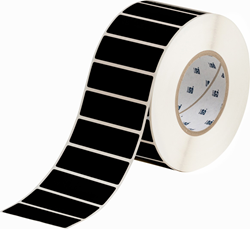 To learn more, check out the Durable Black Polyester Labels Information Sheet. Brady Corporation is an international manufacturer and marketer of complete solutions that identify and protect people, products and places. Brady’s products help customers increase safety, security, productivity and performance and include high-performance labels, signs, safety devices, printing systems and software. Founded in 1914, the Company has a diverse customer base in electronics, telecommunications, manufacturing, electrical, construction, medical, aerospace and a variety of other industries. Brady is headquartered in Milwaukee, Wisconsin and as of August 1, 2015, employed approximately 6,400 people in its worldwide businesses. Brady’s fiscal 2015 sales were approximately $1.17 billion. Brady stock trades on the New York Stock Exchange under the symbol BRC. More information is available on the Internet at bradycorp.com.